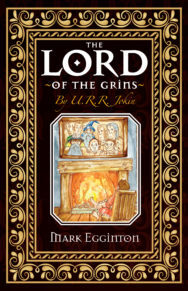 If imitation is the highest form of flattery then affectionate parody can’t be too far below, and Luna Press have published this tribute to the Lord of the Rings phenomenon with superfan Mark Egginton’s Lord of the Grins. So if you’re interested in finding out about Sourone’s mission to retrieve his lost nose ring from his Goth days, read on . . .
ALL PLEASURES CATERED FOR (EXCEPT THAT ONE). Grimy looked out of the window of the elevator and saw that they were a few hundred feet up the tree. He was beginning to think that Elves didn’t like Dwarves. When they reached the top, the doors opened to reveal their hosts. To Grimy they looked tall and beautiful, but then, other than the Halfbits, everyone did to a Dwarf. The hair of Gadabout was as golden as the sun shining on a golden thingy, strangely similar to Colorall No5. Legless looked quite drawn, and wasn’t actually listening; his mind was on the ice-cold beer that awaited him in The Stagger Inn. Paragon looked pained as he told the story of The Bridge of Khaziboom. He told them of the fate of The Grand Alf. ‘He fell in Moribund, locked in combat with an ancient evil,’ and he would say no more. ‘It was a Labdog of Mortcough,’ explained Legless. ‘No, he fell into a big hole,’ said the small voice of Pipsqueak from the back. 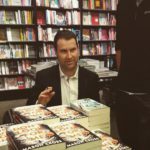 ‘They are disposable Ringbreakers, cannon fodder, not much use for anything else at all really,’ whispered Paragon. ‘Yes, I can see one of these carries the nose ring,’ said Gadabout. Her gaze fell upon Foodo and he heard a voice within his mind, saying, ‘Foodo of The Snore, you have come through many perils. Ill-Farter knows how you got here. We will meet later when the others are asleep for we have much to discuss.’ Gadabout was Muddy Earth’s top Psychic, Mind Reader, Fortune Teller and Spoon Bender. Foodo was instantly worried, as he had never been alone with a female before and thought he had better stick close to Stan.